July Landscaping Tips for Fourth of July! July is the month in which our country celebrates its independence. This is also the month in which Atlanta reaches an average high near ninety degrees. With the southern heat is is important to keep your grass watered so that you can enjoy the luscious greens before it turns dormant in the coming seasons. 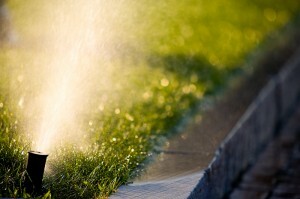 One way to ensure that your grass is watered is to check and adjust the irrigation system in your yard. Southern Living offers several helpful tips and tricks to make sure that your irrigation system is working properly. A few tell-tale signs of poor maintenance include erosion, standing water, dying plants, and overspray onto streets or sidewalks. It is also important to check for proper water pressure as you won’t want the pressure to be too low, or too high. Additionally, don’t forget to check those heads and valves to ensure that the system is working together as a whole. In addition to checking your irrigation system, July is a great month to keep up on other things around the backyard. We’ve included a helpful list of suggested July lawn maintenance tasks below. Mow, trim and edge lawn areas. Check and adjust irrigation system. Hydroseed lovegrass and warm season grasses. Hutcheson Horticultural Company is more than willing to assist with your landscape maintenance needs. Contact us today to schedule our landscape maintenance crew to assist you in Woodstock and around the greater metro Atlanta area.